Available in fixed or adjustable mounting systems, ClosetMaid Ventilated steel wire shelving features fully encapsulated, vinyl coated wires and welds at every intersection to protect against corrosion and maintain structural integrity over the life of the product. 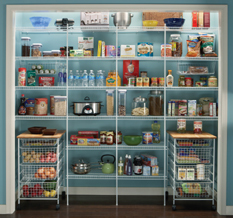 Fixed or adjustable shelving systems are economical, functional and extremely durable. The ventilated design of the shelving encourages air flow which helps items stay fresher for longer, promotes drying and reduces dust. 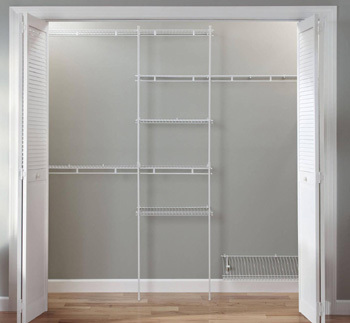 With a variety of pre-designed options, ClosetMaid shelving offers ventilated wire shelving to suit a number of applications around the home. Choose your shelving based on shelf depth, wire diameter and density and spacing between wires to suit your project and strength requirements. All ClosetMaid steel ventilated wire shelving systems are manufactured from cold drawn steel, significantly improving the average tensile strength and performance characteristics of the steel. Our shelving is created by welding every wire-to-wire intersection, with each weld protected against corrosion by a vinyl coating that fully encapsulates both the wires and the welds. A method which is superior to standard epoxy coatings because it is more resistant to chipping and discolouration. Traditional epoxy coatings tend to provide less coverage, sealing only at wire weld joints and leaving some sections of the shelf exposed to environmental damp and humidity promoting rust that over time, compromises material integrity. 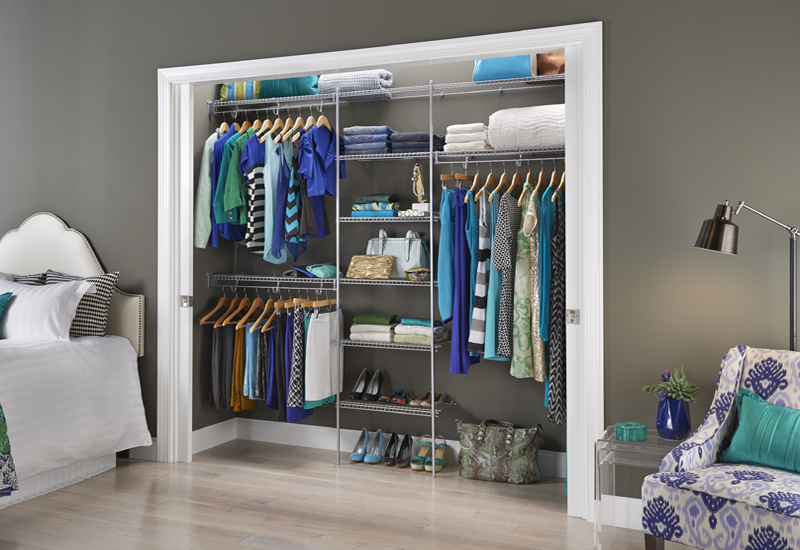 ClosetMaid is also committed to sustainability and we use recycled steel to manufacture our shelving. Find out more about sustainability here. Ventilated wire shelving allows for visibility of stored items. 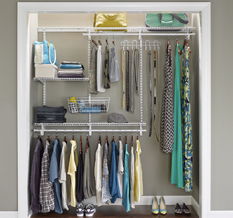 Standard shelf offering integrated closet/ hang rod. Small support causing slight interruption every 30.5cm/ 12" along hang rod. Thicker diameter wire used for closet/ hang rod offering additional strength & sturdiness. Available depths: 25.4cm/ 10", 30.5cm/ 12" and 40.6cm/ 16". 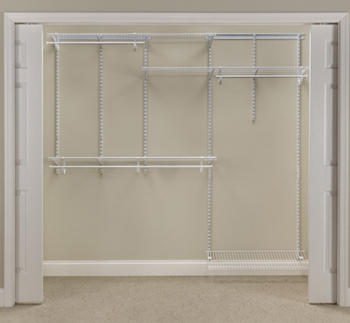 Standard shelf offering optional closet/ hang rod which can be added. Specially formed supporting brackets offer continuous sliding along hand rod if used. Additional lateral wires offering heavy duty support. Available depths: 30.5cm/ 12" and 40.6cm/ 16". Standard and basic shelf idea for folded items such as linens. Can also be mixed and matched with other shelf styles to create personalised storage solution. Low profile lip also available. Available depths: 15.2cm/ 6", 22.8cm/ 9", 30.5cm/ 12", 40.6cm/ 16", 50.8cm/ 20". 1.5cm/ 0.6" wire spacing instead of standard 2.5cm/ 1". 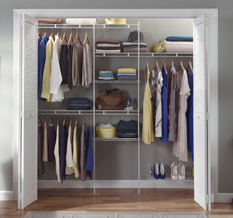 Prevents small items from tipping over in pantry/ linen storage areas. Available depths: 22.8cm/ 9", 30.5cm/ 12", 40.6cm/ 16" and 50.8cm/ 20".